Deborah Hausman and her partners in Holland have sold their 3 year-old stallion “Arrow” (Special D x Sandro Hit) to IPS Horse Group as a future prospect for Anky Van Grunsven. 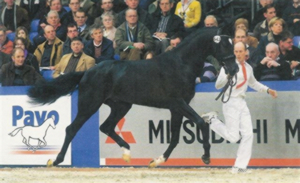 IPS is one of the largest stallion stations in all of Holland and owner of up and coming stallion “Painted Black” also shown by Anky. Deborah had purchased Arrow as a weanling and believed he would make it through the approval process. Following the sale Arrow, was approved and is now licensed in the Netherlands for breeding. His new name is “Andretti”.